We make lot of aval based dishes on Krishna Jayanthi. 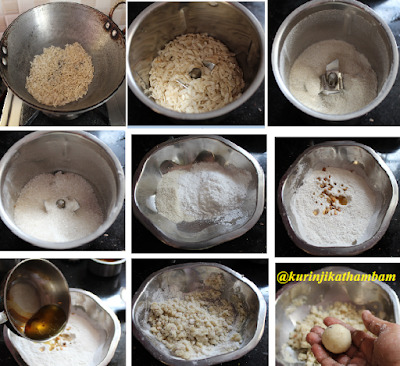 Aval Ladoo is a simple and quick to make recipe. 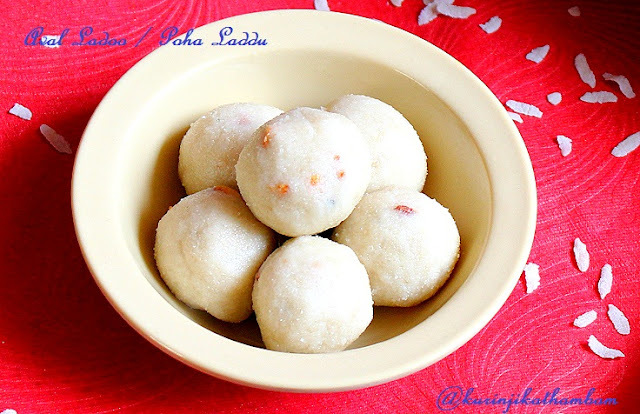 This is alternative for rava ladoo and healthier also because aval is better than rava. 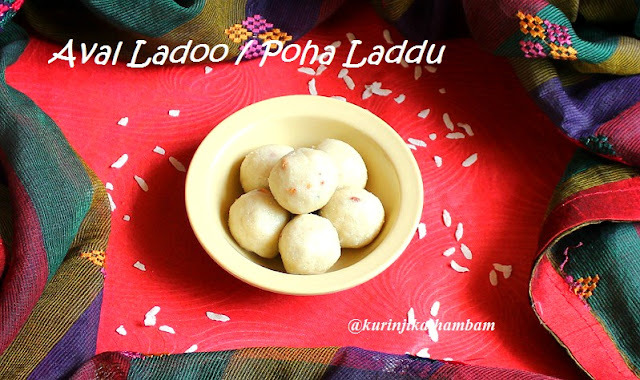 The taste of aval ladoo is also similar to the rava ladoo. 1. Dry roast the aval till nice aroma come out from it or till the aval becomes light yellow in color. 2. Allow it to cool down completely and make it into a fine power using the mixie. Keep it aside. 3. Then powder the sugar and cardamom together into a fine powder using the same mixie. 4. Now mix both the powders in a wide bowl using the spatula. 5. Heat 1 tbsp of ghee and fry the cashews till they become golden color. Pour this into the aval and sugar mixture. 6. Now heat the remaining ghee, add the hot ghee little by little and mix the aval mixture quickly with spatula. At one stage the mixture looks like bread crumbs or puttu maavu consistency. 7. Now stop adding the ghee. Immediately make gooseberry size balls from the mixture. You have to make the balls when the mixture is little bit hot otherwise the balls will break down. Yummy and mouth melting ladoo is ready. 1. Powder the aval first before powdering the sugar. 2. 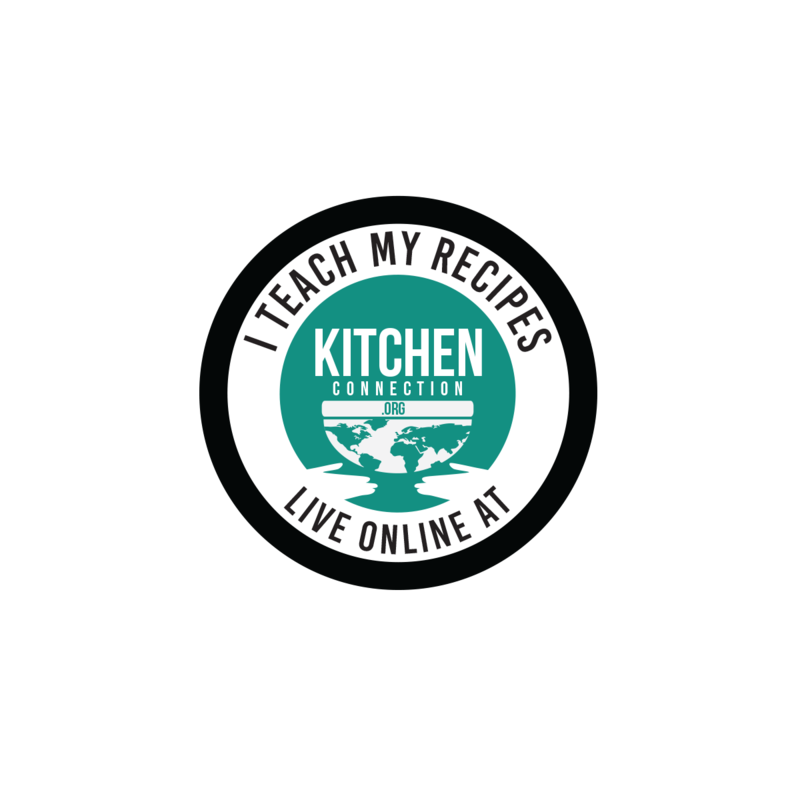 Do not pour more ghee than the ratio suggested. Otherwise the balls will not be dry and in perfect shape. 3. Use Jaggery instead of Sugar.